Let's not forget the heartfelt longing of the actual building of the Beit HaMikdash. There's an old, well-known story with a moral, of a sea captain who was at sea for months at a time, leaving his wife and young son at home. In order to make sure her son remembered his father, the wife/mother put a framed picture of her husband near her son's bed and would tell him stories about his father each night at bedtime. Their nightly routine ended with the son kissing the picture of his father (and then saying Sh'ma). After a particularly long sea voyage, the father returned home, much to the delight of his wife and son. That first night it was the father's turn to regale his son with exciting stories of his most recent voyage. As the father was tucking his son into bed for the night, the son took the framed photo and gave it a kiss. I don't really remember the context in which I first heard this parable, nor its original moral, but I would like to apply it to this week's sedra. It is in this week's sedra that we are commanded to "Make a Mikdash for Me, and I will dwell among you." The materials for the Mishkan were eagerly contributed and the work commenced. On R"Ch Nissan 2449, almost a year out of Egypt, the Mishkan was erected and ready to function. The Mishkan accompanied Bnei Yisrael for 39 years of wandering in the Midbar. After crossing the Jordan River, the Mishkan stood in Gilgal for the 14 years of conquest and distribution of the Land among the Tribes. When things settled down, the Mishkan was set up in its first semi-permanent location of Shiloh, where it stood for 369 years. Upon the death of Eli Ha- Kohen, Mishkan Shiloh was destroyed and it was relocated in Nov for 13 years and then in Giv'on for 44 years. Then, 480 years after the Exodus, the building of the Beit HaMikdash in Yerushalayim was commenced in Yeru- shalayim by Shlomo HaMelech. The building took four years, and lasted 410 years (including those first four) until it was destroyed. 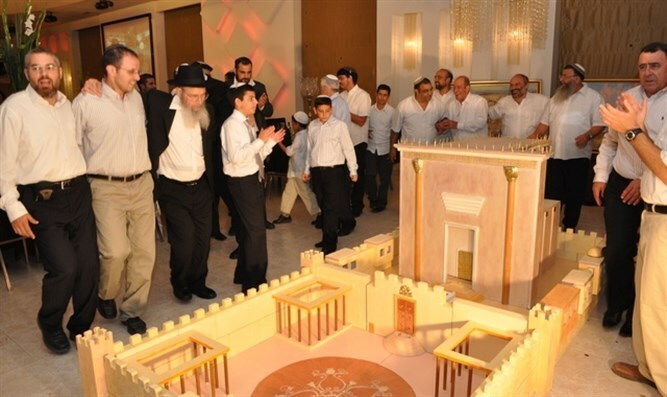 Seventy years later, the building of the second Beit HaMikdash was begun. That Mikdash lasted 420 years until it was destroyed. Counting from the time we became a Nation, we had a Mikdash of some sort or another for approx. 1380 years. It has been approx. 1950 years since we had a standing Beit HaMikdash. That's a long time. Almost 60% of the time we have existed as a Nation. It's a very long sea voyage without a Mikdash. Now let's apply the parable. We have developed many pictures of the sea captain in his absence. We have the shul - our Beit Mikdash me'at. We have the Mishkan and Mizbei'ach that we constructed in our hearts - as in BILVAVI MISHKAN EVNEH... we have the Kotel, we have our prayers which besides being prayers, do double duty of replacing korbanot, as in UNSHALMA FARIM S'FATEINU. We have songs - YIBANEH HAMIKDASH, and others. We have so many pictures to kiss... Let's not forget the heartfelt longing of the actual building of the Beit HaMikdash.